It’s always fun when you have little ones around, to get out in the first snow of the year and try to really pay attention to it. 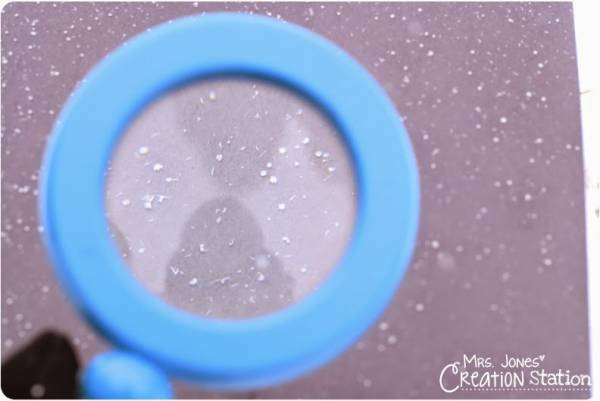 Mrs. Jones’ Creation Station has a great blog post about observing snowflakes, and ll you need is black paper, a magnifying glass and some falling snow. It’s a great time to talk about making observations, to draw or cut out or craft snowflakes and remember that each one is different (well, sort of, anyway), and to talk to older kids about why that is if you want to. And don’t forget some hot chocolate or another special treat to mark the occasion. Do you do anything special for the first snow? I’d love to hear about it!